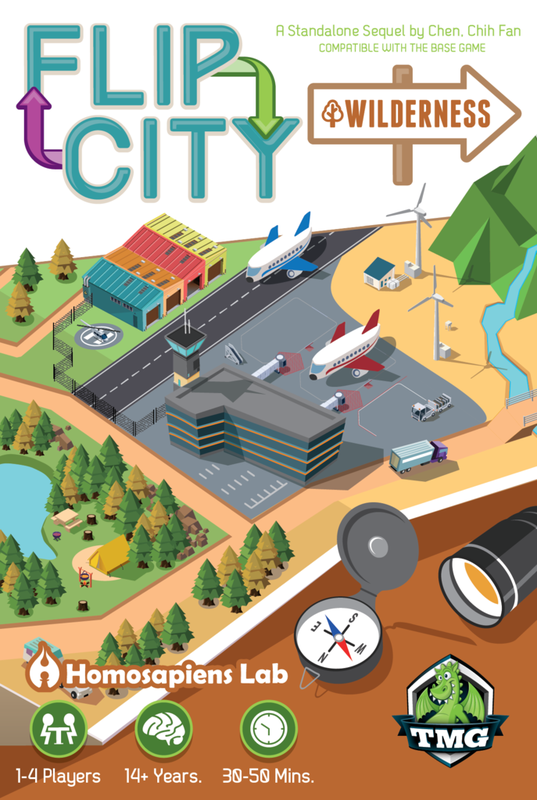 Flip City: Wilderness is a standalone games as well as an expansion for Flip City by Chih-Fan Chen, published by Tasty Minstrel Games. It is for 1-4 players. This expansion adds 5 new types of doubles sided cards, as well as some Happiness tokens that can be used with the game. For more information on Flip City and how to play the game, please follow the link below. To use this game as a standalone game, here are the setup instructions. To begin, each player will be given a deck of cards consisting of 4 Trailer Parks, a Logging Site, a Wind Farm, a Country Resort, a Farmer’s Market and a Camping Grounds. Players shuffle their cards together with these named sides of the cards face up. This forms their starting deck. It should be noted that since these cards are double sided, the player should shuffle their cards beneath the table or in a way that they can’t determine what the top card of their deck is. The general supply decks are then formed and placed in the middle of the play area in separate stacks. These stacks consist of 12 Logging Sites, 12 Farmer’s Markets, 8 Wind Farms and 8 Camping Grounds. The cards should be placed with these sides face up in the stack. Any remaining cards should be returned to the box. The first player is chosen and play now begins. The rest of the rules of the game remain pretty much unchanged. So what exactly does this expansion add as far as new content? Well as I previously mentioned, there are 5 new types of double sided cards. There is the Trailer Park/Country Resort, Logging Site/Archaeology Site, Farmer’s Market/Interchange, Wind Farm/Airport and Camping Grounds/Water Reservior. When combining this game with either the base game or the Reuse expansion, the general supply should not have any piles of cards with the same color title bar on them. That would mean that is you were using Reuse, you couldn’t have stacks for both the Flea Market and the Logging Site. As far as the base game is concerned, you wouldn’t be able to use the Hospital and the Farmer’s Market. You would choose one stack or the other. Everything else would pretty much remain unchanged. Like the previous versions, this expansion adds several new card types. There’s the Trailer Park which is a lot like the Residential Area from the base game. It must be played when it’s the top card of the player’s deck. When it flips it beomes the Country Resort that allows the player to flip it and shuffle it into another player’s deck. The Logging Site when it’s recycled is returned to the bottom of the player’s deck. When it flips it becomes the Archaeology Site that allows the player to spend 20 coins to gain 3 points during the Building Phase. The Farmer’s Market, when it’s bought, allows the player to remove a card from the game that they played during their turn. When it flips it becomes the Interchange that must be left in the player’s discard pile when they shuffle their discard pile. The Wind Farm, when it’s bought, gives the player 2 coins and allows them to flip once during their Building Phase. When it flips it becomes the Airport that allows the player to choose a card in any player’s pile, and shuffle it into that player’s deck. The Camping Grounds, when bought, up the limit on the player’s unhappiness by 1, making it possible to have more unhappiness during their turn. When it flips, it becomes the Water Reservior that gives the player 3 coins that may only be used for Flip and Develop actions. Also included with the game is a set of smiley faced happiness tokens which are optional. Mainly these can be used for both the Camping Grounds in this game and the Church from the base game. They are placed over an unhappiness token, negating it. They are then discarded at the end of the player’s turn. This game has a few less cards than the original game, only containing 76 instead of 86. There are more of the Trailer Park, Logging Site and Farmer’s Markets than there are of the more expensive Wind Farm and Camping Grounds. The cards have the same look and feel as those of the original game and expansion. The same cartoonish artwork is prevalent on these too. The same linen style finish and quality of the cards is also there. What is new in this box however is the punchboard card of happiness tokens. I really like these a lot. They are great at helping remember different card effects. I also like the new art designs on the different cards for this one. I love the outdoor feel that this game gives the player. The art style is fun and simple. I think if you liked the previous expansion or the original game, then you’ll most definitely like this one. Overall, I think that this expansion improves on the already nice design of the previous games. The rulebook for this expansion is very similar to that of the original game. It’s a huge double sided sheet of paper that folds out. The paper has the same thickness as that of the original game’s rules. It has lots of nice looking pictures on it, especially one that highlights all the components. There’s also a look at how the general supply should be setup and a detailed look at the cards with plenty of explanations of each part. The rules cover the different phases of the game in great detail and even include a nice solo variant as well. The rules also explain how to use this expansion with the original game and the Reuse expansion. That said, there are several typos throughout the rules. The rules mention that there are 76 double-sided cards in 6 types, when there are only 5 types. Even the cards have a typo, spelling Water Reservoir as Water Reservior. Overall, it’s nothing major and is easily overlooked. Other than that, the rulebookd does a fairly good job of explaining the rules. The great thing about this game is that it can be played as either a standalone game or it can be an expansion to be combined with either the base game or the Reuse expansion. Either way you choose to play it, it’s fun. I like the new cards and how they work with the base game. I really like combining everything together and playing like that. It gives so many more options when you’re buying new cards. Just like with the base game, I like the flipping mechanic that this expansion uses as well as the push your luck feel that it provides. Both give this game/expansion a unique feel that is unique to other deck building games out there. I especially enjoy the new happiness tokens and find them to be quite useful with the game. For fans of the original game, this simply adds more content to an already great game. For those new to the game, this is a great way to get a feeling for the game and see if you like it as much as I’m sure you will. Either way, I recommend this as both an expansion and a standalone game. 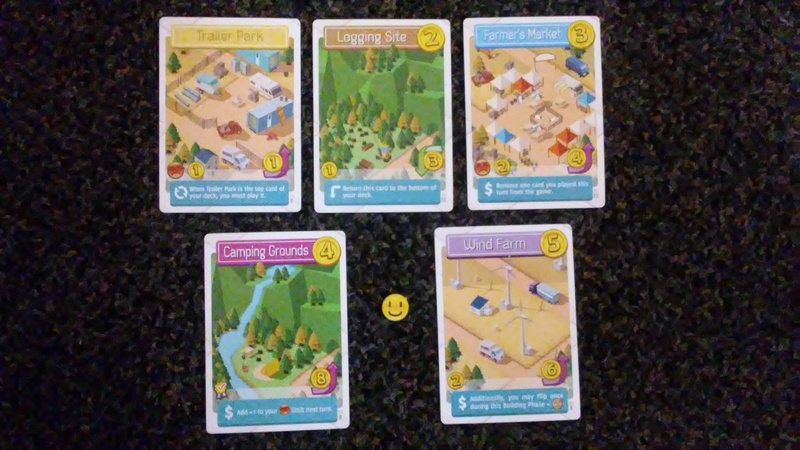 Flip City: Wilderness is an expansion for Flip City that can be played as a standalone game. It adds 5 new double sided card types to the game as well as some happiness tokens. The game is still the same as far as play time goes. Most game sessions last around 35-40 minutes. The artwork on the cards is fun and captures the new wilderness theme in a cartoon style. The rulebook has a few typos that also made their way to some of the cards as well. However it’s only a minor annoyance. This game works well either way you choose to use it. As an expansion it’s great for fans of the original Flip City It’s also great for new players and makes a great way to try out the game. Either way, it’s one that I would recommend. Now have some fun and flip the script. This entry was posted in Print and Play Productions and tagged board, board games, card, card games, chen, chih, chih fan, Chih-Fan Chen, city, flip, flip city, games, minstrel, tasty, tasty minstrel, wilderness. Bookmark the permalink.